Any parent wants the best for their precious baby. This means that you need to find all the right baby essentials to keep your little one comfortable and safe. One such baby essential is a bassinet. This is a great item to have. This is because it’s a great place for your baby to sleep. Finding the best baby bassinet is important. That is if you want your little one to sleep comfortably through the night. Bassinets are a place for infants to sleep. They are typically smaller than a crib and are ideal for younger infants. You place the bassinet right next to your own bed for easy access. You will be able to see your little one easily and tend to him/her throughout the night. Bassinets are very useful. If you keep them next to your bed, you breastfeeding sessions can be more manageable. All you have to do is reach over and carry your little one. This is also beneficial when you are recovering from giving birth. During the first few days or weeks, you aren’t as mobile so having a bassinet right next to you is convenient. Here are some excellent products for you to go through. They all have their own features so make sure to read through all of them. The right one for you may just be on this list! This beautiful bassinet has a lovely leaf pattern design. It’s made with stylish fabric and an elegant profile. The Delta bassinet comes with a nightlight that’s attached to it. It gives off a soothing glow to dispel the darkness. It also has a module which plays lullabies. The canopy of this bassinet is adjustable. You can also detach it if you need to. Finally, it’s one of the more affordable products on our list, which is a big plus. Lightweight bassinet which can be moved around from one room to another. The frame is made of solid steel which is durable. The canopy can be adjusted and detached. Comes with a soothing nightlight and music to calm your baby. The cover doesn’t stay attached to the bassinet’s frame. The Karley bassinet is a pretty little bassinet which is also easy to carry around. But even if it’s lightweight, it can support babies who weigh more than 20 lbs. This bassinet is very easy to assemble. This makes it convenient even for moms who are still pregnant or who have just come home from delivery. You can even take this bassinet outdoors. It comes with a dual canopy, which will keep insects away from your sleeping baby. Ideal for newborns and babies who weigh up to 25 lbs. Available in many different colors to match your little one’s room. Assembling the bassinet at the beginning is easy. The canopies are permanently attached. Finding sheets that fit can be a challenge. The BRICA bassinet is a great place for your baby to sleep in any place! It’s a comfortable bassinet which you can easily carry around with you, no matter where you go. The lightweight model has a carry handle. The frame is made of steel, so it’s guaranteed to be safe and durable. You can also lock the frame to keep the whole bassinet stable. It’s very easy to set up and fold back down when you’re done with it. The mesh panels of the bassinet allow for great air circulation. It’s made with fabric that is breathable and a frame which can be locked. The frame is made of durable steel to ensure your baby’s safety. Lightweight and portable. It even has a convenient handle for you to carry it around. Not ideal for babies who weigh more than 15 lbs. Not suitable for babies who move around a lot. This fun bassinet is the most unique on our list. This is because you can swivel it 360 degrees around. You can adjust the bassinet to fit any space. It’s also convenient because you won’t have to walk around it to pick up your little one. The HALO bassinet is safe for your baby. That’s because it doesn’t contain harmful flame retardants. You can let your baby sleep comfortably in this sleeping space for up to 5 months. Has a unique rotating feature. You can swivel your baby around gently to pick him/her up from any position. The side wall can be lowered or locked upright. It’s perfect for small or narrow spaces because of the adjustable base. Also, it includes a waterproof mattress pad which is made from polyurethane. Lowering the walls to get your baby takes effort. The mattress it comes with isn’t very thick. This bassinet serves as a comfortably secure sleeping place for your little one. It has wheels for you to move it around your home. It plays calming music and sound effects to help your baby doze off and sleep well. The Summer Infant bassinet is ideal for your newborn until he/she weighs about 15 lbs. It comes in a lovely, modern design. Underneath the bassinet is a huge basket where you can store your other baby essentials. It comes with some great electronic features. These include sounds of nature, melodies, sounds from the womb and vibrations to calm your baby. The basket is large and the canopy can be adjusted. Includes a mattress sheet for the mattress. Castors can be locked to ensure safety. Doesn’t come with the batteries which are required. The mattress it comes with is quite thin. 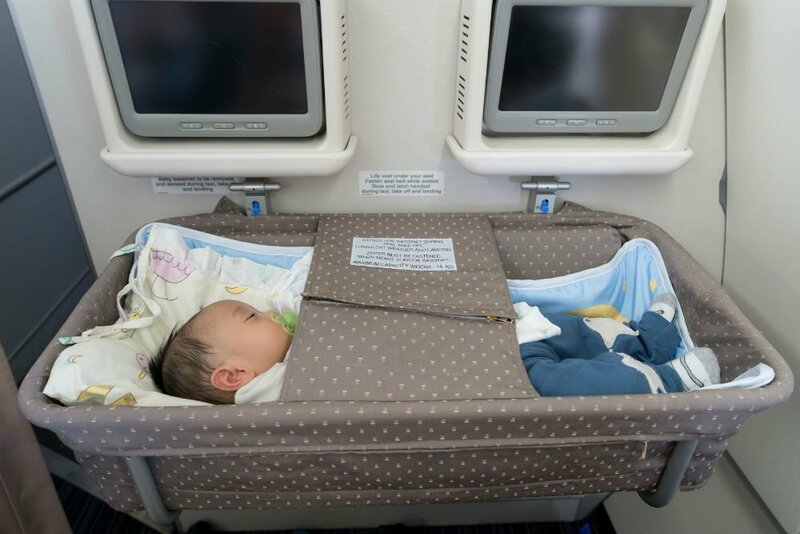 This travel crib looks simple but it’s cool. It’s a portable crib which you can bring around while traveling, hence the name. The Chicco bassinet is lightweight and easy to set up. You need very little time to open it and fold it back up. The legs are detachable too, making it even easier to carry along. The mesh windows are from nylon material, permitting the right amount of air to flow freely. The fabric parts of this crib are easily removable. Extremely easy to set-up. All you need is a few seconds and you’re good to go. The parts which are made from cloth can be removed easily for washing. Includes a big bag for carrying, storing and traveling. It doesn’t slide around the room because the feet are anti-slip. It’s not as big as other travel crib choices. This bassinet is a superior product because it’s very versatile. When you reverse it, then it becomes a changer for your baby. Aside from that, it also comes with an extended use feature for the diaper changer. This means that you can change your baby here as he/she grows. You can keep on using it until your baby weighs 30 lbs! The Graco bassinet comes with a soothing vibrating action. The mesh sides of the bassinet allow you to see your baby even from afar. And they also allow for good air circulation, while the canopy provides shade from harsh light. Finally, it comes with 2 adorable soft toys for your little one to focus on. The bassinet is reversible. It doubles as a changer table. Diaper changer has an extended use feature. The vibrating aspect comes in 2 speeds, which you can set as needed. Comes with 4 wheels which can be locked. It’s tricky to assemble the bassinet at the beginning. This adorable Disney bassinet is a great choice if you want your baby to listen to music while sleeping. It plays calming music and it vibrates gently too. It also comes with a nightlight to soothe your little one even in the dark. It’s a comfortable bassinet which provides entertainment for your baby. It has a base which glides and casters which you can lock. This feature permits you to convert it to a stroller. It also comes with a canopy basket for you to store your little one’s things. The canopy basket can be adjusted or detached as needed. Comes with a soothing vibration feature and plays calming music too. It’s easy to move this bassinet around because of the attached casters. Comes with a mattress pad and a fitted sheet for it. You have to make sure that the casters are locked. Batteries are required to function well. The Big Oshi bassinet is another superior product. It’s sturdy and durable but lightweight enough to be brought around, no matter where you go. It comes with a net to cover the bassinet while outdoors. This will guarantee that no insects will get into the bassinet and harm your little one. Finally, the bed is constructed with a sturdy wooden base. This is beneficial for your baby’s growth. It’s a lightweight bassinet which can be used indoors and outdoors. Comes with a handy basket for storing. The base of the bed is made with wood. This is designed to allow healthy growth and development of your baby’s vertebra. The bassinet has canopies on both sides to make certain of your baby’s comfort. It doesn’t rock forward and backward. Zipping up the sides of the canopy is a challenge. The Lamont bassinet looks simple and classic. But it’s functional and comfortable too. The manufacturers of this product were thinking about safety as they created this product. The side parts allow for great ventilation and air flow for your little one. The legs lock in together through a special locking mechanism to ensure stability. Because the base is wide and the rails are curved, you are sure that this bassinet won’t be going anywhere. It’s an affordable product which comes with instructions which are simple to follow. Breathable design allows for great ventilation. The leg base is curved and sturdy. An affordable bassinet which comes with a shelf for storage. It comes in a lovely, traditional design. Doesn’t come with wheels, making it difficult to move around. The hood is attached permanently. As you can see, there are a lot of amazing products out there. And since we’ve narrowed down the list for you, choosing the right one becomes less of a chore. We believe, though, that one of these products is a cut above the rest. Our choice is the Delta Children Sweet Beginnings Bassinet. It’s the best baby bassinet because it’s dual purpose. You can use this sleep space as a diaper changer. And it can even accommodate babies up to 30 lbs. It’s not like the BRICA Fold N’ Go Travel Bassinet, which is placed on the floor. It also has a more neutral color, making it suitable for boys or girls. It’s also superior to the Lamont Home Good Night Baby Bassinet because it has wheels for you to move it around. You can lock the wheels of the sleep space as needed. This is a great safety feature so it won’t move around when bumped into. It’s an all-around care center for your little baby.